Sessions’ DACA speech was full of nativist lies. 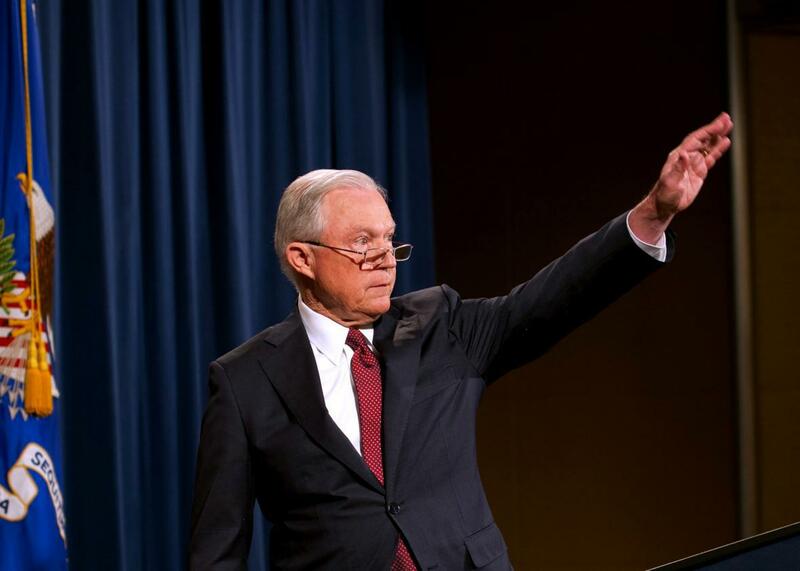 Attorney General Jeff Sessions waves after speaking on the Deferred Action for Childhood Arrivals program on Tuesday at the Justice Department in Washington. Let’s examine these falsehoods in turn. Even without the study, it should be obvious that DACA played no role in this surge of unaccompanied minors because the theory itself makes no sense. Undocumented children who arrived in the United States following DACA’s implementation would not qualify for the program. Only those individuals who “have continuously resided in the United States since June 15, 2007” and “were physically present in the United States on June 15, 2012” could receive DACA status. Why would parents send their children to the U.S. to participate in a program in which they are not legally permitted to participate? Second: Sessions alleged that DACA has “denied jobs to hundreds of thousands of Americans by allowing those same jobs to go to illegal aliens.” This line is obviously drawn from the false narrative that immigrants steal jobs from American citizens. There is no actual evidence that DACA recipients have taken jobs from any Americans, let alone “hundreds of thousands.” There is, however, strong evidence that killing DACA will significantly damage the economy—a fact that Sessions conveniently omitted from his speech. Once DACA is fully rescinded, its former recipients will lose their work permits (and thus their jobs) and face possible deportation. According to the left-leaning Center for American Progress, about 30,000 people will lose their jobs each month as their DACA status expires. The loss of these workers could reduce the national GDP by $280 billion to $433 billion over the next decade. According to estimates by the libertarian Cato Institute, DACA’s demise will cost employers $2 billion and the federal government $60 billion. Trump’s decision to end DACA isn’t a job-saver; it’s a job-killer. Toward the end of his speech, Sessions praised the RAISE Act, a Republican-backed bill that would tightly curtail immigration into the U.S. Sessions claimed the act would “produce enormous benefits for our country.” In reality, the measure marks an effort to return America to an older immigration regime that locked out racial and ethnic minorities. Sessions has praised the 1924 law that created this regime—a law whose chief author declared that his act was meant to end “indiscriminate acceptance of all races.” On Tuesday, Sessions revived this principle in slightly more polite language. The attorney general’s utterly gratuitous defamation of young Latino immigrants tells you everything you need to know about the decision to kill DACA. Before Tuesday, the Trump administration seemed eager to frame its DACA decision as respect for constitutional separation of powers: Congress, it insisted, not the president, must set immigration policy. But after Sessions’ speech, it is difficult to view this move as anything other than an attempt to implement the white nationalism that Trump and Sessions campaigned on.